Delayed onset muscle soreness, or DOMS, is caused by microscopic tears to your muscle fibers after intense physical activity that result in inflammation of the muscles. The pain is most noticeable the day after skiing. There is no way to speed up the recovery process, but there are several steps you can take to make your legs more comfortable. Take ibuprofen or acetaminophen to provide some relief to your sore legs. Muscle weakness and tightness is still present after taking over-the-counter medication, but the pain is significantly reduced once these medications take effect. Apply ice to your affected muscles during the first 24 to 72 hours. Ice reduces inflammation and relieves pain. After 72 hours, apply a heating pad to your affected leg muscles or soak in a steamy bathtub. After 72 hours, DOMS spontaneously decreases. Stretch your legs gently while massaging the affected areas. Neither of these techniques alleviate DOMS from skiing, but the massage and stretch feels good on sore muscles. The pain should remain after the massage and stretching is complete. Drink low-sugar, caffeine-free sports drinks that provide electrolytes. If you did not drink fluids while skiing, your muscles may ache from an electrolyte imbalance. Sports drinks help you stay hydrated while skiing and rehydrate you afterward, which can relieve some muscle aches. Rest your legs for a few days and get plenty of sleep while your legs are sore. Without rest and sleep, your muscles become increasingly fatigued making it difficult for your leg muscles to recover. Once you experience DOMS, you do not experience the soreness again until you increase your intensity level. 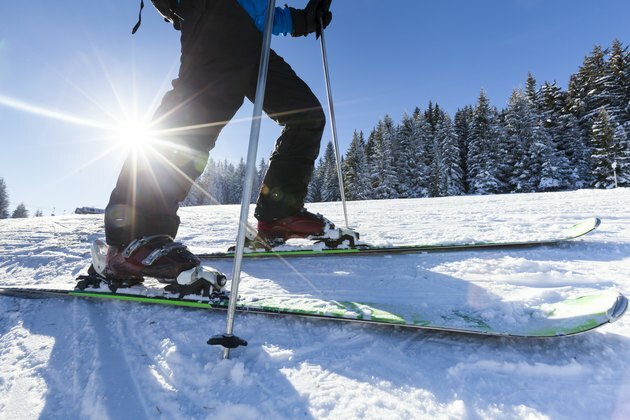 Strength train the major muscle groups of your legs two to three weeks before skiing to induce DOMS and hopefully prevent the occurrence during your ski trip. Do not drink alcohol or caffeine while skiing since these increase your risk of dehydration, which increases your risk of muscle soreness. DOMS is a natural process of muscle adaptation that does not require treatment. If your soreness is getting worse or it’s difficult to walk, consult with a doctor since you may have a severe strain, sprain or even a stress fracture. Do not fall asleep with a heating pad on your legs and do not apply ice directly to your skin. Do not bounce while stretching your legs since this can cause tears in the muscle and worsen your symptoms.